Review: Do you like stores of adventure? If you said yes, well than I have a story for you. 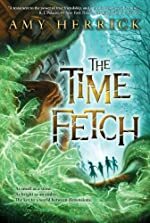 The Time Fetch by Amy Herrick is full of adventure. A boy named Edward begins the adventure. One day he is going to school like a normal kid would and he finds a rock, but all around things start disappearing. So actually what he just picked up was a time fetch. When you wake it up to early in its hibernation, bad things would happen. All around Edward are sidewalks disappearing and kids to. All that is left is Edward. And so Edwards adventure begins. The Time Fetch is a fantastic book for young readers because it has all the right qualities. One, it has good story, Two, it had a good adventure, and three, it is filled with action. This book also reminded me about this one time when it was my responsibility to do something. I would give or recommend this book to anybody that likes a good adventure.